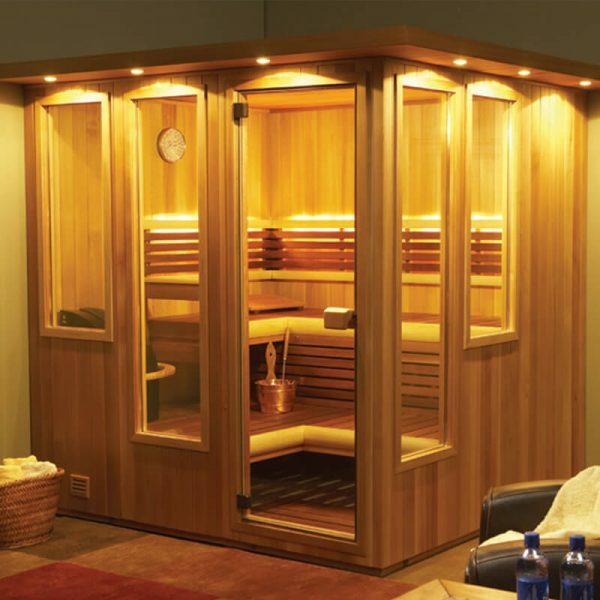 The clean, contemporary styling of Finnleo® 's Designer Saunas makes it almost impossible to believe they’re assembled from pre-fabricated panels. Choose from multiple Designer styles, all from the finest woods and carefully crafted to Finnleo® 's standards. The Mystique was created for the popularity of contrasting wood colors and glass. The Mystique highlights the grain even further by treating it with a special all natural oil-rubbed mixture. This “Latte” treatment brings out the richness in the wood and aids in keeping the benches clean. Expansive use of bronze-tinted glass with four sidelight windows and an all-glass door, creates a warm glow when viewing from outside, and a panoramic view from inside.